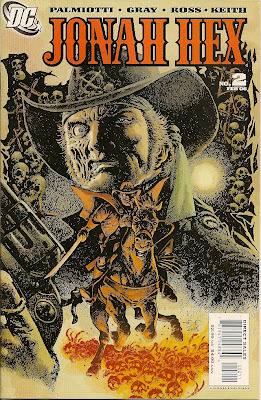 Matching Dragoons: Jonah Hex V2 #2 "Dia De Los Santos Reyes"
Jonah Hex V2 #2 "Dia De Los Santos Reyes"
"Dia De Los Santos Reyes"
Children are playing with a pinata at a Spanish mission when several men come riding in on horseback and start slaughtering everyone in town. One of the riders kicks in the front door of the church and the priest there knows him. The priest starts reprimanding the man and is quickly shot. The thieves then come in and grab the large cross on the altar. The priest stumbles down the hallway to a room where his niece Alma is tending to a wounded man on a cot. The priest tells Alma to tend to the wounded in the courtyard. 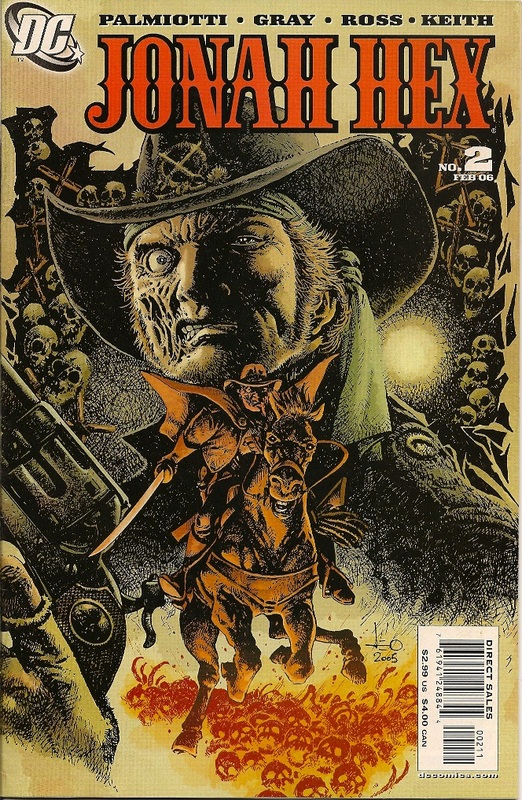 She leaves and the priest talks to Jonah Hex. He begs that Hex will repay the kindness they have shown him by bringing back the sacred cross and then he falls dead. Hex tells the dead priest to rest easy because tomorrow all the thieves will be dead. Hex gets dressed, mounts up and heads out of town, but right alongside him is Alma. Jonah says that she isn't going, she says that she is. Alma then explains that the man who killed her uncle is Santiago, an orphan that her uncle took in and raised him along with Alma as brother and sister. Jonah says that he can't afford to have anything slow him down. Alma pulls out a knife, asks Hex if he can see the knot in a sapling about fifty feet away. She hurls the knife while riding and Hex pauses, grunts and then tells her to try to keep up. They continue riding and come upon the outskirts of Silverton, a mining town. There are two sets of gallows outside of town with a total of eight men hanging from them. They ride into town to witness a man getting gunned down in the street and then ripped apart by a mob that digs the silver bullets out of the corpse. Hex tells her to be quiet about the Santaigo and the cross. One man, Branson Ironside, steps forward and inquires what business Hex and the Alma have in town. Hex tells Ironside that he has quite a town. Ironside says that after the war he was not happy to reside within the Union. Hex asks about the men hanging outside of town and says that he has been tracking them for six days, but it appears there are a few missing. Ironside states that he will rectify that slight by noon tomorrow. Ironside then invites Hex to stay in town and 'join their ranks'. Jonah politely declines and he and Alma head for the hotel. Ironside then tasks one of his men, Chester, to tail Hex. At the hotel, Alma asks if the town knows about the cross and Hex figures that they do. Later that night in the room, Hex postulates that since the town does not have a bank, the cross must be in the jail, locked up with Santiago. Jonah is going to snoop around and pilfer some dynamite from the supply store. He has Alma strip and prance in front of the hotel windows in order to distract anyone tailing him. Jonah climbs out of the hotel and then breaks into the supply store. He stocks up on dynamite and matches, leaving payment for both on the desk. He makes his way to the jail, verifies his suspicions about the cross and Santiago, and then places several sticks of dynamite around about the town. Finished, he heads back to the hotel room. He climbs in the window and is greeted by Alma, Ironside, and two gunmen. Ironside has Hex's guns removed and states that he will hang Hex in the morning as a warning to everyone that enters the town. Jonah replies that sooner or later the cowardly greedy bastards in town are going to turn on Ironside and learn that he is a coward. The gunmen knock Hex out. Later, Hex is escorted into the middle of town. Everyone is gathered around and Ironside is getting a shoeshine in the middle of the street. He hands Hex a pistol with a single bullet in it. 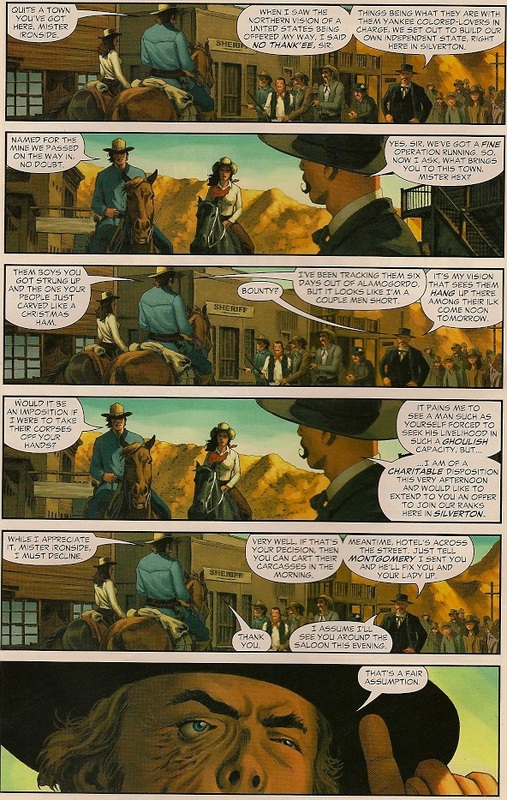 Ironside addresses the town, stating that he has gathered them in order to learn that Hex has come to town to steal the silver from their mine. Hex denies it, but Ironside asks who can trust the word of bounty hunter that lives off the plunder of corpses. Hex draws and fires, shooting past Ironside and rupturing the kerosene streetlight. Ironside, sweating bullets, is amazed that Hex has missed but he takes his time to draw and aim, knowing that Hex is out of bullets. He asks "Who's the coward now?" to which Jonah replies, "See me runnin', Ironside?" Just then the burning stream of kerosene ignites the dynamite hidden under the boardwalk behind Ironside and things start getting blown to hell. Ironside fires a few shots and miss, but Jonah slugs a gunman, grabs his pistol and nails Ironside right between the eyes. Hex then grabs a flaming board and tosses it across the street, igniting another stick of dynamite and that starts a chain-reaction of building after building exploding. The townsfolk are running in a panic and Hex and Alma head for the jail. Hes opens the cell with the cross and grabs it, heading out. Santiago pleads to be released or he and the others will die in the jail. Alma says that the Lord will have his justice on Santiago on His own terms. As Alma and Jonah leave the jail, the entire town has mounted up and headed for the mine. Since Ironside is dead, they plan to gut the mine as quickly as possible. Hex loads up the cross onto a wagon and head out of town, along with the entire populace. Everyone rushes into the mine but there is a sudden cave-in and everyone dies. Alma says "Those poor people." and Jonah, driving the wagon into the rising sun, replies, "Not so poor...they're buried in silver." An average issue, we pick up with Jonah in the middle of an adventure, not unlike the prior issue. I enjoyed the character of Ironsides, how he knew Hex and thought that he could just offer him a job in order to control him. The ending of the story seemed rushed with the mine collapse, there was nothing to indicate that it could happen and it was just a quick wrap-up to get rid of the towns people and give them what they deserved. I did like the view of Jonah's scarred back, making me wonder if this was a nice reference to the Ship of Doom. There was also a couple of gripes about the artwork, one page was waaaay to static, almost reminding me of Renato Arlem and his photostats. And there were a few misplaced word balloons on the next to the last page. All in all, the series is like a toddler finding its footing, a mis-step here, a wobble there, but all in all, this book is up and walking. Next Issue : Hex encounters an "Outlaw by tragic error." RE the scars on Jonah's back: that's kinda how I always figured he'd look in real life, what with how many times he'd been shot and stabbed and generally roughed-up over the years, not to mention the puma that clawed his back when he rescued that Apache chief as a boy. Throw in that whipping you mentioned and yeah, he'd be a mess. I was thrilled to see that the new Hex crew felt the same way when I got to that page of the issue! I know I have this, and I know that I probably enjoyed it at the time...but I honestly forgot all about the plot! Isn't the new Hex book supposed to come out this week? 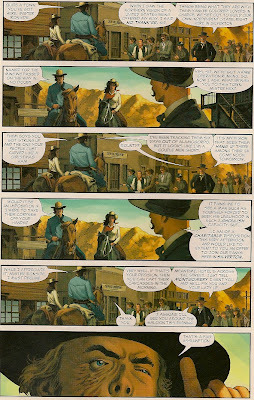 Yup, All-Star Western comes out this week. I'll be nabbing it on Wednesday & I hope to have an initial impression on Wed night.